An intelligent fan system designed for cooling audio video, DJ, server, network, and IT equipment racks. Protects rack-mount equipment from overheating, performance issues, and shortened lifespans. Programmable thermostat controller with automated speed control, alarm warnings, and backup memory. Premium anodized aluminum construction with CNC-machined detailing for a professional appearance. An intelligent cooling fan system designed to be mounted onto a wide range of 19-inch racks requiring quiet or high airflow cooling. Maintaining an optimal temperature for rack-mount equipment prevents overheating, ensures constant performance, and extends their lifespan. The LCD digital controller features a programmable thermostat with automated speed control, alarm warnings, status alerts, and backup memory. The system is housed in a solid aluminum construction that takes up one rack units of space (1U). Each aluminum frame is anodized with a light-brush finish, then the corners CNC-machined and edges chamfered for a high-end professional appearance. This model holds six custom-engineered dual-ball bearing fans rated at 67,000 hours, and certified by CE, UL, TUV, and RoHS. The fans are set to exhaust out heated air out the front and should be positioned near the top of the rack; a rear exhaust version of this model is available, sold separately. This complete kit includes the 1U fan unit, corded 6-ft thermal probe, user’s manual, rack mount screws, cage nuts, and corded 6-ft power supply. Programming includes an easy-to-use thermostat and a SMART mode that automatically adjusts the fan’s speed to react to varying temperatures. Additional features include alarm alerts, fan failure triggers, power savings setting, display lock, and backup memory. Six fan speeds are available with three screen brightness settings. Behind the unit is an expansion port that can control another CLOUDPLATE unit or an AC Infinity rack roof dual-fan kit. 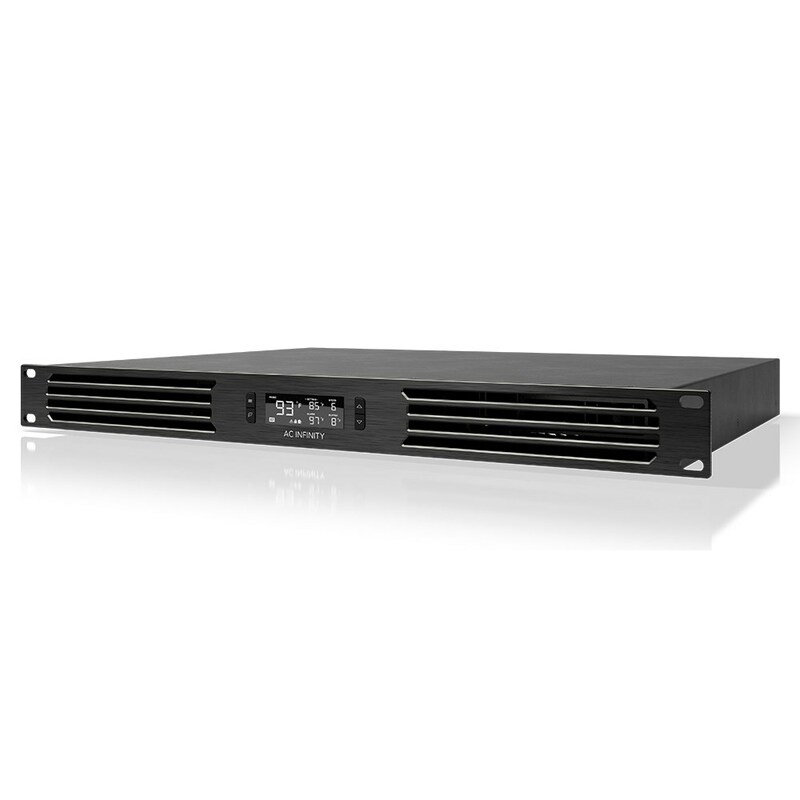 This 1U rack cooling system features programmable fan speed control, enabling it to work for a wide range of rack mount applications. 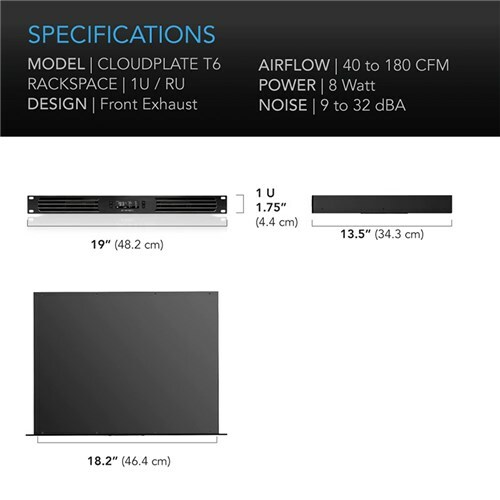 With a noise level that can reach 8 dBA, the fan system can be used for environments where low or minimal noise is required such as home theater, studio, DJ, and audio video racks. A max airflow rating of 60 CFM will provide sufficient cooling to server, network, IT and equipment racks requiring high airflow.